You are buying Abbott PediaSure Peptide 1.0 Strawberry Ready To Feed Case of 4, model #62121. ADW Diabetes offers a complete line of enteral feeding supplements for both children and adults. 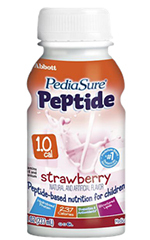 The Abbott PediaSure Peptide 1.0 Strawberry Ready To Feed Case of 4 is a nutritionally complete, peptide-based formula for the nutritional needs of children ages 1-13 years with malabsorption, maldigestion, and other GI conditions. PediaSure Peptide has a hydrolyzed, whey-dominant protein source, 50% MCT and structured lipids, and Nutraflora scFOS, a prebiotic soluble fiber. PediaSure Peptide is ideal for tube or oral feeding as sole-source or supplemental nutrition. It is the only certified Kosher status peptide-based product. For use under medical supervision. Meets or exceeds 100% of the DRIs for protein and 25 essential vitamins and minerals for children 1 to 8 years of age in 667 mL (1000 Cal); for children 9 to 13 years of age in 1000 mL (1500 Cal). Only peptide-based pediatric product with Kosher status. Feeding sets are for single-patient use only. Use clean technique to avoid set and/or product contamination. Water, Corn Maltodextrin, Sugar (Sucrose), Whey Protein Hydrolysate, Structured Lipid (Interesterified Canola, Medium-Chain Triglycerides), Hydrolyzed Sodium Caseinate, Medium-Chain Triglycerides, Canola Oil. Less than 0.5% of the Following: Short-Chain Fructooligosaccharides, Calcium Phosphate, Potassium Citrate, Natural & Artificial Flavors, Cellulose Gel, Magnesium Phosphate, Soy Lecithin, Potassium Chloride, Magnesium Chloride, Ascorbic Acid, Carrageenan, Choline Chloride, Sodium Citrate, Cellulose Gum, m-Inositol, Taurine, Sucralose, Ferrous Sulfate, Zinc Sulfate, dl-Alpha-Tocopheryl Acetate, L-Carnitine, Calcium Pantothenate, Niacinamide, FD&C Red #3, Manganese Sulfate, Thiamine Chloride Hydrochloride, Pyridoxine Hydrochloride, Riboflavin, Cupric Sulfate, Vitamin A Palmitate, Folic Acid, Chromium Chloride, Biotin, Potassium Iodide, Sodium Selenate, Sodium Molybdate, Phylloquinone, Cyanocobalamin, and Vitamin D3. Contains milk and soy ingredients.